An emerging concept in cosmetic surgery is that the characteristics of facial aging are a result of not only elastosis and sagging but also the atrophy of soft tissue and, particularly, fat. [1, 2] The evolution of this concept is well illustrated in the field of lower lid blepharoplasty, in which the traditional approach to the amelioration of so-called bags is to resect the "herniating" orbital fat. While this method can indeed eliminate bags, it may also eliminate the soft tissue that conceals the infraorbital rims, creating a hollowed, skeletonized appearance (see the top half of the image below). This is in contradistinction to the truly youthful face, in which soft tissue fullness creates a smooth, almost imperceptible transition from the cheek to the lower lid, with no visibility of the bony orbital rim. Top. Drawback of traditional lower blepharoplasty. In the youthful face, the lower lid has a smooth contour, and the underlying infraorbital rim is invisible (A). With age, the orbital septum becomes slack, permitting the herniation of orbital fat into bags (B). Traditional lower blepharoplasty calls for resection of protruding fat; the result can be accentuation of the infraorbital rim and hollowing of the orbit (C). Bottom. Arcus marginalis release. After dissecting the orbicularis off the septum, cutting cautery is used to release the arcus marginalis (A). Orbital fat is advanced, and the orbital septum is reset onto the facial aspect of the maxilla. Both fat and septum are secured to periosteum with multiple interrupted 5-0 polyglactin sutures (B). The result is a smooth contour that obscures the infraorbital rim and resembles the contour of youth (C). Multiple alternative approaches have been and continue to be devised to address this problem. One such technique that has gained prominence is the arcus marginalis release, in which orbital fat is advanced (rather than resected) to reconstruct the soft tissue of the lower lids. [5, 6, 7, 8] This technique is designed to conceal the underlying bony structure of the inferior orbit in an attempt to impart a more youthful contour to the periorbital area. The image below depicts the anatomy of the lower eyelid. Anatomy of the lower lid. The orbicularis oculi (O) overlies the orbital septum (S), which retains the orbital fat pads (F) within the orbit. The septum fuses with the maxillary periosteum (P) inferiorly and the tarsus (T) superiorly. 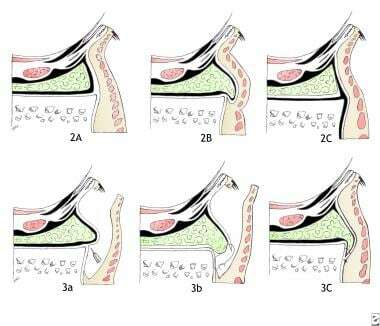 The capsulopalpebral fascia (C) arises from the fascial sheaths of the inferior rectus (R) and inferior oblique (Q) and merges with the septum at the tarsus. The inferior tarsal muscle (M) is contained within the capsulopalpebral fascia. The orbicularis oculi muscle is immediately deep to the skin of the lower lid. This muscle extends from near the ciliary margin past the infraorbital rim to the cheek. Deep to the orbicularis is the orbital septum. The suborbicularis fascia, a plane of loose, fibrous connective tissue, intervenes between the orbicularis and orbital septum and provides an excellent dissection plane. The orbital septum fuses superiorly with the tarsal plate and inferiorly with the periosteum of the infraorbital rim; this inferior attachment of the septum is termed the arcus marginalis. The arcus marginalis is strongest and most sharply defined medially, where it attaches to the anterior lacrimal crest. As it extends laterally, the arcus marginalis thins and weakens. It also assumes a more inferior and anterior insertion; thus, medially, it runs along the inner aspect of the rim, but laterally, it attaches approximately 2 mm inferior to the rim on the facial aspect of the zygomatic bone. Three compartments of orbital fat are located posterior to the orbital septum. Many delicate fibrous septa invest these compartments. The inferior oblique muscle, originating from the anteromedial orbital wall, separates the medial and central fat compartments as it extends posterolaterally under the globe. The arcuate expansion, an extension of the fascial sheath of the inferior oblique, continues laterally to attach to the lateral orbital rim and separates the central and lateral compartments. Subtle differences exist among the 3 orbital fat pads. The fat of the medial compartment is typically white and membranous, while that of the other 2 compartments appears yellow and fluffy. The lateral fat pad contains more septa than the others and is therefore less likely to herniate anteriorly. Lower palpebral vessels travel directly through the medial fat pad. 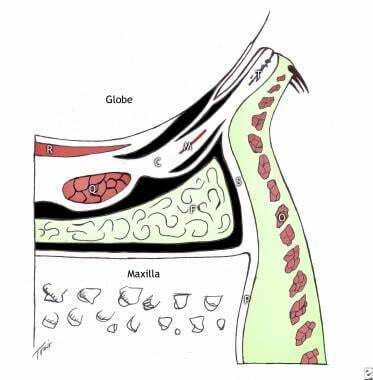 The capsulopalpebral fascia, a structure analogous to the levator apparatus of the upper lid, extends between the orbital fat pads and the globe. The capsulopalpebral fascia arises from the fascial sheaths of the inferior rectus and inferior oblique and, along with the orbital septum, inserts at the inferior margin of the tarsal plate. Included among its many layers are a lax superficial membrane, a muscular component (inferior tarsal muscle), and a deep layer that attaches to the conjunctival fornix. Almost any blepharoplasty patient with lower lid bags and/or infraorbital skeletonization is a candidate for arcus marginalis release. Even among those who have previously undergone traditional blepharoplasty and were dissatisfied with the hollow appearance of their eyes, finding and advancing enough orbital fat to correct the iatrogenic depression is usually possible. Contraindications for arcus marginalis release mirror those of any blepharoplasty procedure. In particular, patients should be questioned about a history of dry eye symptoms, and evaluation by an eye specialist should be obtained if there is any question of lacrimal insufficiency. Extreme caution should be exercised when considering this procedure for patients with a personal or family history of bleeding disorders, as the risk for retrobulbar hematoma may be higher in these individuals. Arcus marginalis release is generally not indicated in young patients with a congenital excess of orbital fat. Traditional resection of the excess fat is appropriate for these patients. Some surgeons prefer general anesthesia because injection of local anesthesia into the lower lid can distort soft tissue anatomy. On the other hand, injection of an epinephrine solution can provide hemostasis and facilitate dissection. If performed with the patient under conscious sedation, the incisions should be marked with indelible ink prior to injection of the lids. A transconjunctival approach may be preferable if no skin is to be resected. Using a blade or needle-tip cautery, an incision is made in the conjunctiva just inferior to the lower margin of the tarsal plate, entering the plane between the septum and the orbicularis. The orbital fat remains contained behind the orbital septum as long as the incision is made above the line of fusion of the septum and the capsulopalpebral fascia. If skin is to be resected, a subciliary or subtarsal approach may be chosen. The subciliary incision is made in a line approximately 2 mm inferior to the lid margin, from a point inferior to the lacrimal punctum to one inferolateral to the lateral canthus. (Placing the incision too close to the margin can damage the eyelash follicles, whereas extending it medial to the punctum can disrupt the lacrimal canaliculi.) In stairstep fashion, the dissection plane first passes subcutaneously for several millimeters until the level of the lower margin of the tarsal plate is reached, at which point the dissection plane passes deep to the orbicularis. In this way, the pretarsal orbicularis is preserved, thereby minimizing the risk of denervation and consequent scleral show or ectropion. The subtarsal incision is placed 5-7 mm inferior to the lid margin. While this incision also avoids the pretarsal orbicularis, it is associated with more edema and a slightly more noticeable scar than the subciliary incision. In either case, the incision should not be placed within the depth of a crease, as this increases the risk of scar contracture. Regardless of the approach, dissection proceeds down the plane between the septum and the orbicularis and onto the anterior surface of the infraorbital rim. Now exposed, the arcus marginalis is incised with cutting cautery from medial to lateral along the infraorbital rim, taking care to avoid the inferior oblique muscle (located directly behind the medial third of the septum) and the lateral canthal tendon (see the bottom half of the image below). The septum and orbital fat pads are then advanced over the infraorbital rim. Strong traction on the fat pads should be avoided, since this can tear deep orbital veins. Skin resection, if indicated, is performed last. A skin flap is elevated just superficial to the orbicularis, and the skin is gently advanced. Prior to redraping and trimming the skin flap, the patient's mouth is opened maximally to place tension on the skin of the cheek. This maneuver helps to avoid overresection of skin. The incision is typically closed with running 7-0 nylon suture. Infection of the lid following blepharoplasty is rare, making systemic antibiotic prophylaxis unnecessary. Nonetheless, antibiotic ophthalmic ointment may be applied to the incision line and cornea immediately after surgery and daily thereafter. After a few days, the patient may switch to Lacri-Lube ophthalmic ointment or its equivalent at bedtime and artificial tears throughout the day. Significant postoperative pain is rare, and most patients are comfortable with a mild nonaspirin analgesic. Substantial edema and ecchymosis may follow this procedure. Intermittent application of cold packs over the first 24-48 hours and elevation of the head at least 30 degrees helps to minimize swelling. After the first 48 hours, or when edema has largely resolved, warm compresses can help to expedite the resolution of bruising. Increased pigmentation from hemosiderin deposition is sometimes observed in patients with excessive bruising. To minimize this complication, patients should avoid postoperative sun exposure until the ecchymosis has resolved entirely. Eyelids are extremely sensitive to allergenic insult, and preexisting atopy can be aggravated by surgery. Patients should therefore not use cosmetics for at least 10 days after surgery in order to avoid an allergic reaction. Skin sutures may be removed on postoperative day 3. However, the patient and surgeon must wait several weeks for swelling to resolve and healing to conclude before judging the outcome, since complete convalescence is longer after this procedure than after traditional blepharoplasty. While some patients may be comfortable appearing in public after 1-2 weeks, the final result may not be realized for 3-6 months. Almost all complications stem from inadequate preoperative evaluation. From a medicolegal perspective, a thorough history and ophthalmologic examination are key. At minimum, preoperative visual acuity should be documented and standard photographic views obtained. A Schirmer test and a referral to an ophthalmologist for a more detailed examination may be indicated. Specific complications are described below. Significant postoperative pain is unusual and should alert the surgeon to the possibility of a serious hematoma. Hemorrhagic compression of the optic nerve can lead to visual loss, a complication reported to occur once per 40,000 blepharoplasties. The patient with a retrobulbar hematoma usually complains of a steady, lancinating pain, similar to that of glaucoma. The patient may also report scintillating scotomas or hemianopsia and may exhibit mydriasis, proptosis, chemosis, or conjunctival injection. Because the consequences of retrobulbar hematoma are so severe, aggressive intervention is required. The surgeon should not wait for signs of nerve compression (eg, visual disturbances, afferent pupillary defect) to arise, because permanent damage may have occurred by that time. Rather, excessive pain and proptosis necessitate immediate surgical decompression. The incision should be opened and carefully explored. If necessary, lateral canthotomy may be performed to achieve emergent decompression. Medical decompression of the orbit with corticosteroids (methylprednisolone 100 mg IV), osmotic diuresis (mannitol 50-100 g IV over 30 min), and carbonic anhydrase inhibition (acetazolamide 500 mg IV) may also be used. Ophthalmologic consultation is imperative in this situation. The oculocardiac reflex manifests in approximately 25% of blepharoplasty patients but is almost exclusive to those undergoing local anesthesia. Characterized by intraoperative bradycardia or dysrhythmia, any ocular manipulation, including traction on the orbital fat pads, can trigger this reflex. Most patients demonstrating this reflex experience a heart rate change of less than 30%; however, profound bradycardia and even arrest have been reported. Young females appear most prone to experience the oculocardiac reflex. Keratoconjunctivitis sicca (dry eye syndrome) is most often observed in patients with preexisting lacrimal insufficiency or postoperative ectropion. Diminution of lacrimal function is a normal part of aging, but it can be hastened by diseases such as diabetes and hypothyroidism. Consistent postoperative use of artificial tears is imperative in these patients. Temporary ectropion is common, particularly laterally, as a result of edema, wound contraction, and/or orbicularis hypotonicity. Steri-Strips can be applied obliquely and with tension at the lateral canthus. This provides the lower lid with superolateral support—a sort of "temporary canthopexy"—that can mitigate the ectropion. Permanent ectropion following arcus marginalis release is rare, especially if caution is exercised in septal resetting and skin resection. If the ectropion persists, skin grafting or canthoplasty may be required. Epiphora is common in the first few postoperative days. Corneal irritation, which triggers hyperlacrimation, and ectropion, which removes the punctum from the surface of the globe, usually cause epiphora. Fat necrosis manifests as small, painful, indurated nodules. Compresses and massage hasten their resolution. Injection of steroids into the lesions is effective but carries the risk of subcutaneous atrophy and hypopigmentation. Diplopia is usually caused by injury to the inferior oblique muscle. Permanent visual disturbances caused by blepharoplasty are much rarer than preexisting visual deficits. Performing a preoperative visual examination is imperative to protect the surgeon from unfair blame. Hamra ST. The role of orbital fat preservation in facial aesthetic surgery. A new concept. Clin Plast Surg. 1996 Jan. 23(1):17-28. [Medline]. Loeb R. Fat pad sliding and fat grafting for leveling lid depressions. Clin Plast Surg. 1981 Oct. 8(4):757-76. [Medline]. Goldberg RA, McCann JD, Fiaschetti D, Ben Simon GJ. What causes eyelid bags? Analysis of 114 consecutive patients. Plast Reconstr Surg. 2005 Apr 15. 115(5):1395-402; discussion 1403-4. [Medline]. Hamra ST. Arcus marginalis release and orbital fat preservation in midface rejuvenation. Plast Reconstr Surg. 1995 Aug. 96(2):354-62. [Medline]. Barton FE Jr, Ha R, Awada M. Fat extrusion and septal reset in patients with the tear trough triad: a critical appraisal. Plast Reconstr Surg. 2004 Jun. 113(7):2115-21; discussion 2122-3. [Medline]. Mendelson BC. Herniated fat and the orbital septum of the lower lid. Clin Plast Surg. 1993 Apr. 20(2):323-30. [Medline]. Jiang J, Wang X, Chen R, Xia X, Sun S, Hu K. Tear trough deformity: different types of anatomy and treatment options. Postepy Dermatol Alergol. 2016 Aug. 33 (4):303-8. [Medline]. [Full Text]. Loeb R. Naso-jugal groove leveling with fat tissue. Clin Plast Surg. 1993 Apr. 20(2):393-400; discussion 401. [Medline]. Fezza JP, Massry G. Lower Eyelid Length. Plast Reconstr Surg. 2015 Aug. 136 (2):152e-159e. [Medline]. Rohrich RJ, Janis JE, Adams WP Jr. Subciliary versus subtarsal approaches to orbitozygomatic fractures. Plast Reconstr Surg. 2003 Apr 15. 111(5):1708-14. [Medline]. Nassif PS. Evolution in techniques for endoscopic brow lift with deep temporal fixation only and lower blepharoplasty-transconjunctival fat repositioning. Facial Plast Surg. 2007 Feb. 23(1):27-42; discussion 43-4. [Medline]. DiFrancesco LM, Anjema CM, Codner MA, McCord CD, English J. Evaluation of conventional subciliary incision used in blepharoplasty: preoperative and postoperative videography and electromyography findings. Plast Reconstr Surg. 2005 Aug. 116(2):632-9. [Medline]. Zheng YR, Liu K, Li QF, Li F, Hong SZ. [The application of undermining orbicularis oculi muscle from orbital rim for the correction of tear trough deformity and palabromalar groove in lower blepharoplasty]. Zhonghua Zheng Xing Wai Ke Za Zhi. 2012 Sep. 28 (5):331-3. [Medline]. Christie B, Block L, Ma Y, Wick A, Afifi A. Retrobulbar hematoma: A systematic review of factors related to outcomes. J Plast Reconstr Aesthet Surg. 2018 Feb. 71 (2):155-161. [Medline].